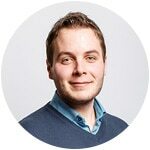 In this guide, you’ll learn the exact strategy I’m using to capture 80,46% of my subscriber’s email addresses in Facebook Messenger with ManyChat. It’s easy to set up and it only requires one click from your subscriber to join your email list. 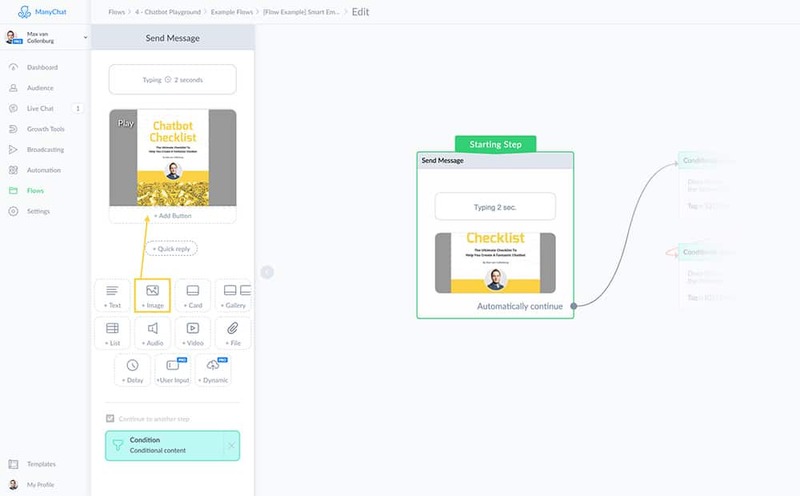 I’ll first show you how to set it up in ManyChat and then how you can add someone to your Email Service Provider & deliver your lead magnet after they give their email address. Bonus: get the exact flow I’m using to capture 80,46% of my subscriber’s email addresses. 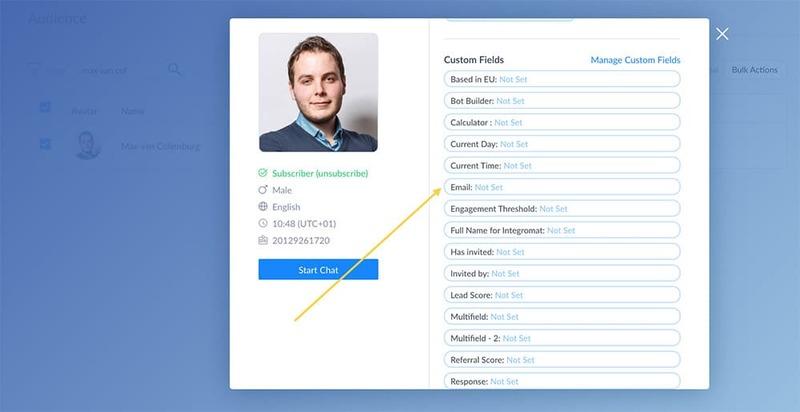 To store the email address in the subscriber’s profile we first need to create a custom field. 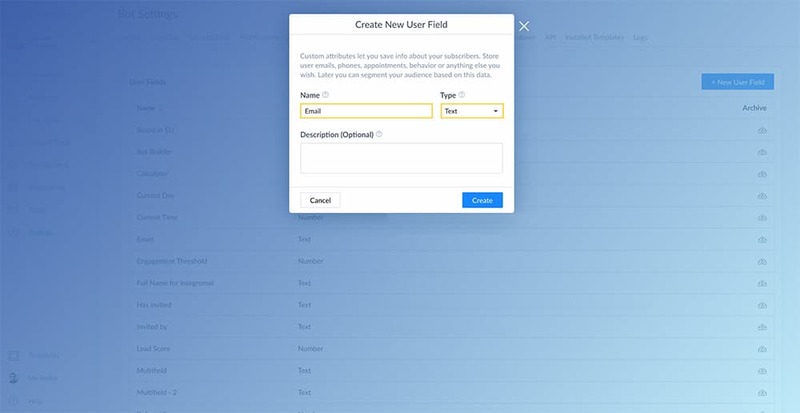 Go to Settings » Custom Fields » New User Field. When you click ‘New User Field’ you’ll see the screen below. Name it email, set the type to text and if you like you can also give it a fancy description. This is where we’re going to store the email address after we’ve asked for it. Ok, this is the fun part. We’re now going to ask for someone’s email address in exchange for a lead magnet. As you see the subscriber only has to click one quick reply to give their email address. To achieve this we have to create a little flow inside ManyChat. Show a visual teaser of the lead magnet we’re giving away. Describe why it would be useful for them. Set the expectation you’re going to ask for an email address. Ask for the email address. Tell them to check their spam folder if they can’t find it. Let me explain you each step. I like to tease people a bit with what they’re about to get. That’s why I show a little GIF of the ebook I’m giving away. You can insert GIFs by inserting an image block. Directly after that, we tell the subscriber what it is and how it will help them. 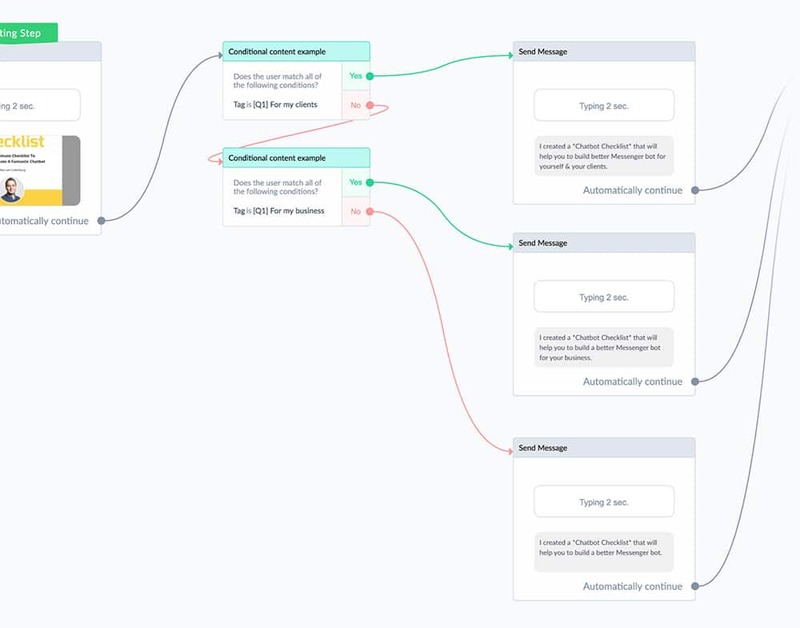 I’m using conditional content to show different messages to different people, which makes it more relevant to them. Then, we set the expectation that we’re going to ask for an email address. This is an important step most Messenger bot builders don’t think about. 1) We’re still giving people a way out. Otherwise, they’ll be stuck in the email capture part. 2) When the subscribers click yes, they do a micro-commitment because they tell themselves that they want it which makes it much more likely they’ll actually give their email address. This is just a simple yes or no question where we ask if it’s okay if we send the lead magnet by email. After someone clicks ‘yes’ we quickly check with a condition if we by any chance don’t have the email address already. If you already captured the subscriber’s email address you can just send the download over to them, which you’ll learn how to do in the next step. But if they didn’t give their email address yet, we have to ask for it first and store it to the custom field we created at the beginning of this guide. 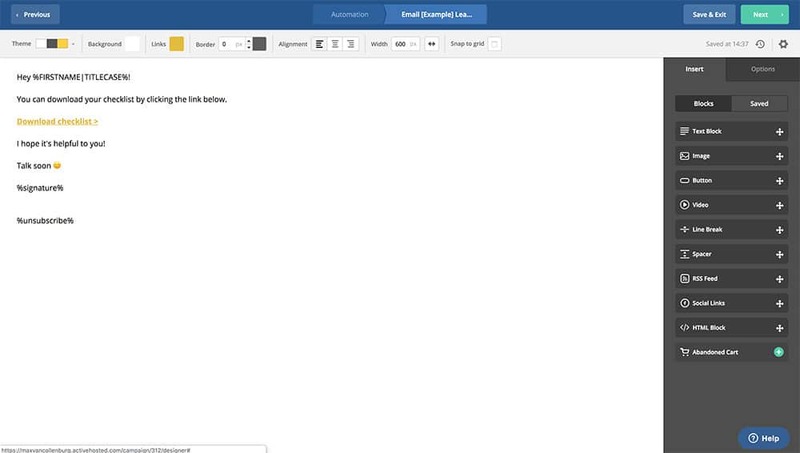 You create a user input field, set the Reply Type to ‘Email’ and save the response to your email custom field. After you’ve created all this, you preview the flow and see if the email address is successfully stored into the subscriber’s profile. After you’ve captured an email address in Facebook Messenger you need to add this email address to your Email Service Provider. Depending on which one you’re using these steps might be slightly different. But most tools work pretty similarly. 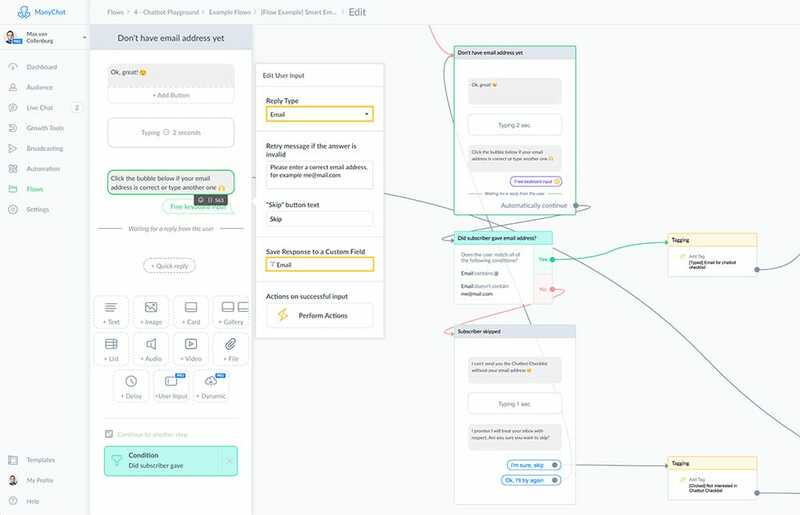 I’ll show you the exact steps for ActiveCampaign, but the process is very similar if you’re using another tool like Infusionsoft, Drip, ConvertKit or MailChimp. 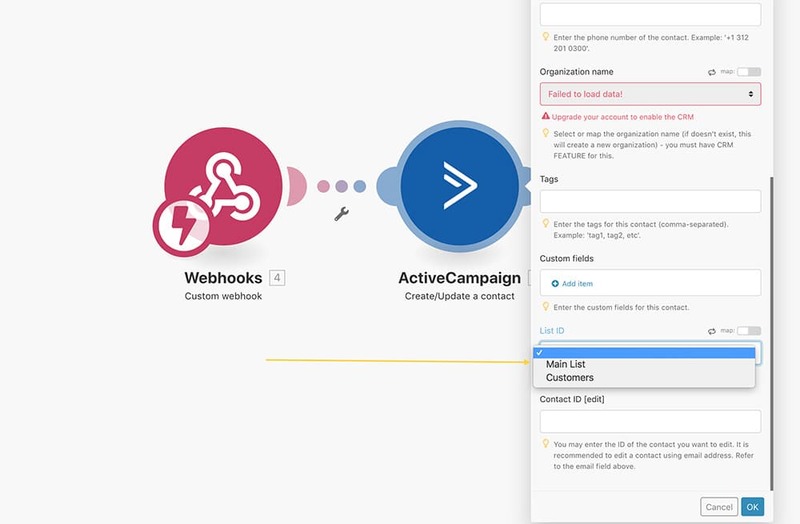 To make the connection between ManyChat and ActiveCampaign we’re going to need a tool called Integromat. It’s pretty similar to Zapier, in case you’re familiar with that, but it’s way more affordable. 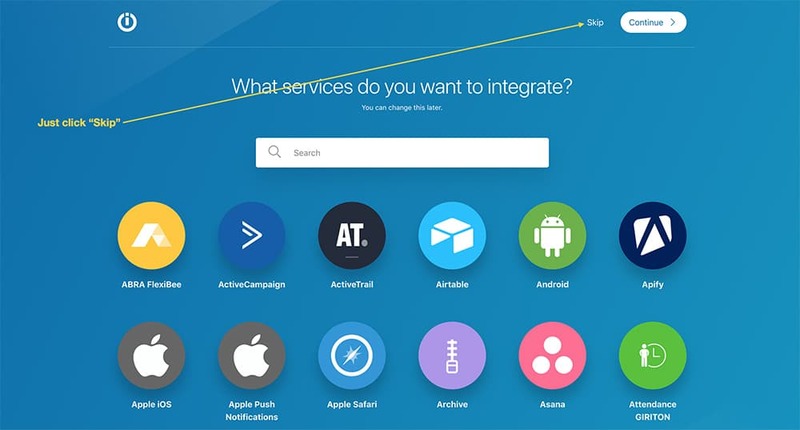 With Integromat you can connect all kinds of tools without any programming knowledge. So the first thing we need to do is to create a new scenario. You’ll see the screen below, just click “Skip”. 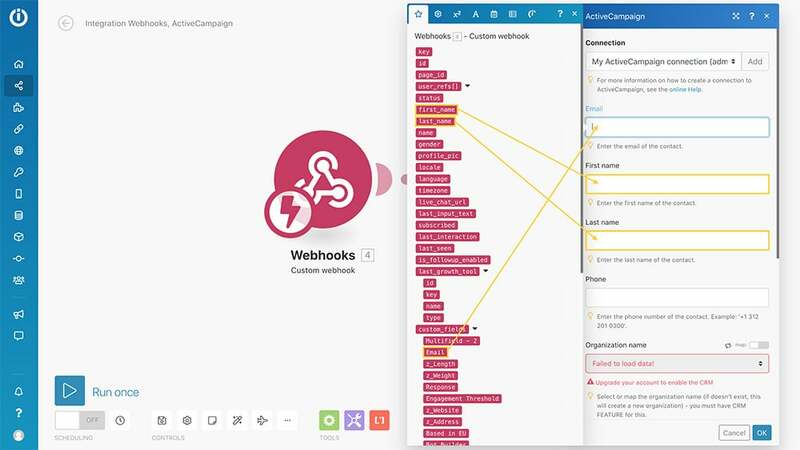 The first step is going to be a webhook. 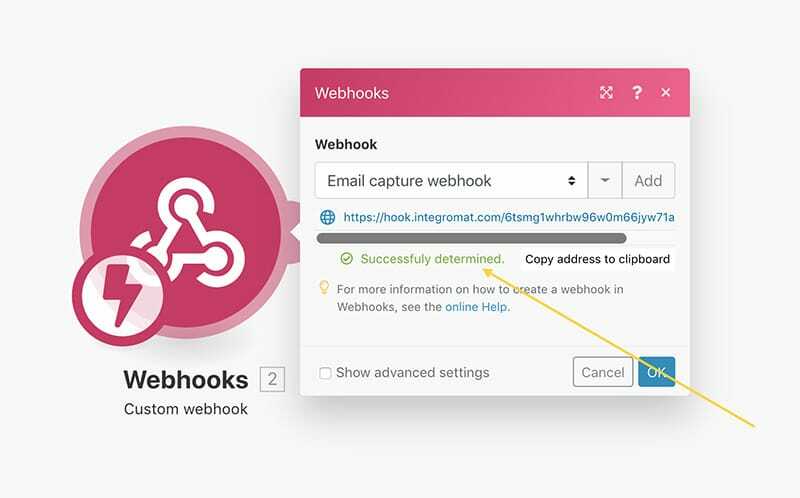 Search for “Webhooks”, click it, click “Custom webhook”, click “Add’, give it a name, click “Save” and copy the URL you see there. We then go back to the flow in ManyChat and add an “External Request” action like I’m doing below. You need to add this directly after the subscriber gave their email address. It’s also possible to use the “Trigger Integromat” action, but I like the External Request better because it’s more flexible. After you’ve done that, go back to Integromat. If you previewed the external request you’ll see a little notification that says that the data structure was successfully determined. That’s important because this way Integromat can use all the little pieces of information that ManyChat gave. If you don’t see it, click “Re-determine data structure” and try to preview the External request again. We’re then going to add another step to the scenario. 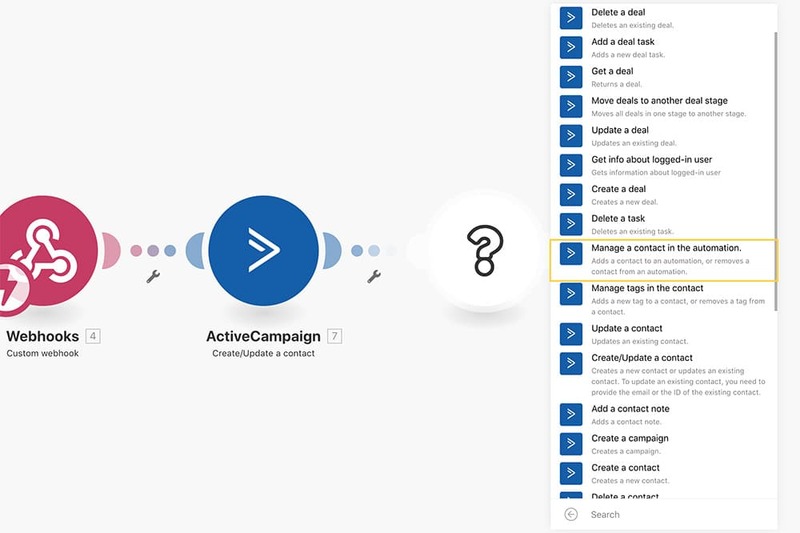 Search for ActiveCampaign & click it. You’ll then see a long list of cool possibilities. 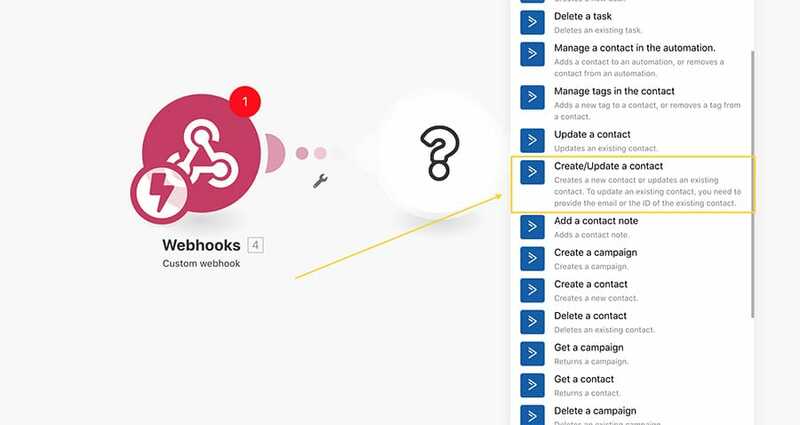 Forget about the rest for now and just click “Create/Update a contact”. 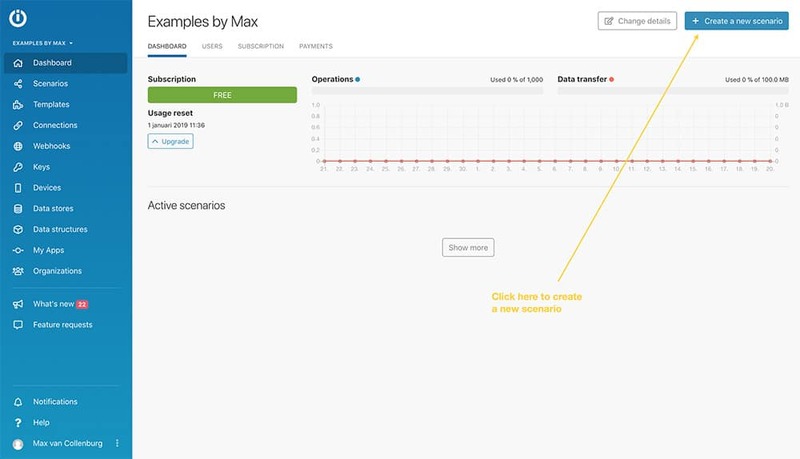 And then use the data from the webhook to fill in the fields. Then scroll down and select the list you want to subscribe this person to. This is also the step where you could add tags to the contact if you like. 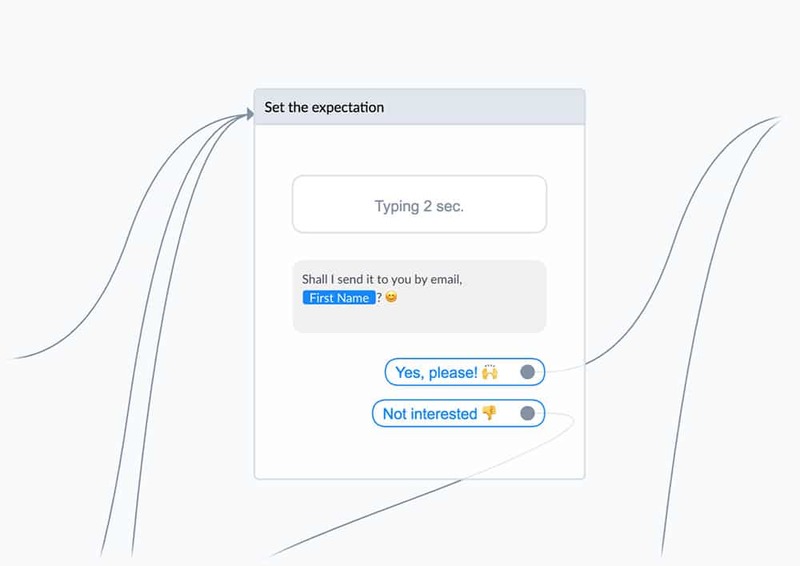 And then click “Run once” & preview the flow in Messenger to test if everything is working. 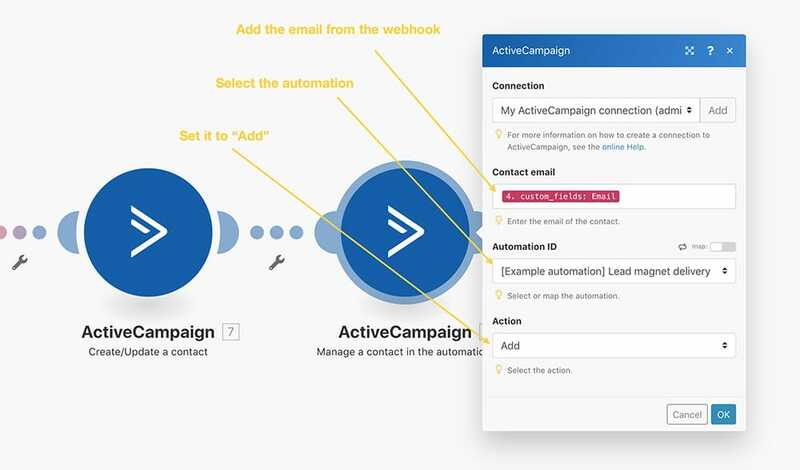 You now know how to capture an email address in Messenger and how to add it to ActiveCampaign. But how do you send the lead magnet your promised? It’s sending the email below and then ends the automation. The only thing left is that we have to add someone automatically to this automation. To do that we go back to Integromat and add another ActiveCampaign module. 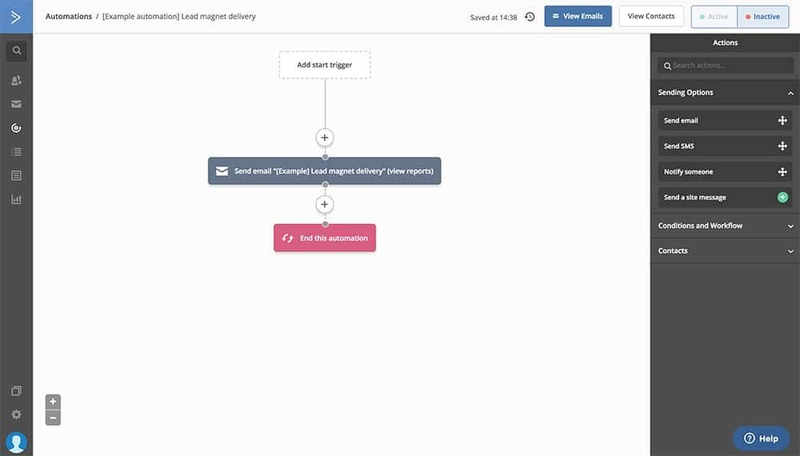 This time we’re using “Manage contact in the automation”. 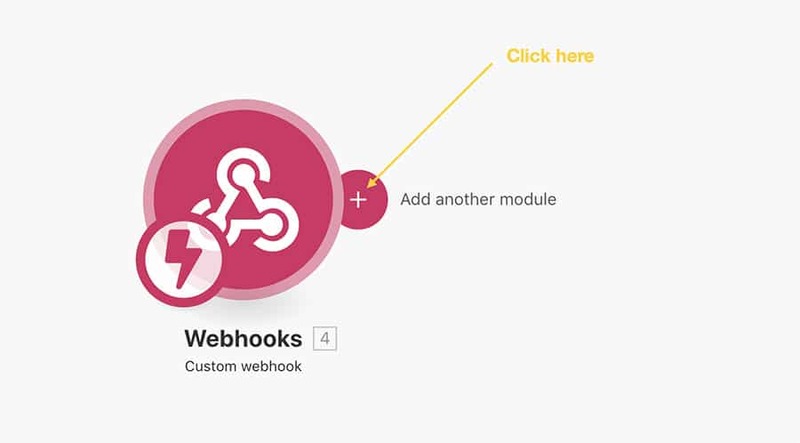 And then we’re using the email address from the webhook module again, select the right automation and set it to “add”. This way you can grow your email list superduper easy by simply asking your subscribers for their email address directly inside Messenger. It’s very user-friendly and because of that highly effective.